With the recent 2018 success of the first ever Process Valves & Actuation priced catalogue, Hydravalve look to showcase their evergrowing product range to a worldwide market. The catalogue contains new additions from Haitima include the FW range of stainless steel 1, 2 and 3 piece ball valves and the 2013KMDR reduced bore 3 piece firesafe approved ball valve available in both carbon and stainless steel. Further additions include high performance butterfly valves, cast iron ball valves, class 800 gate, globe and check valves, bronze PN25 rated lift check, globe, gate and y-strainers and fire protection valves. 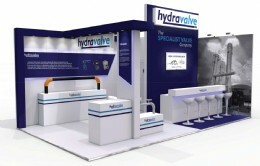 Hydravalve will be exhibiting at their first ever Valve World with a bespoke modular stand which will display the core valves and actuators that can be supplied from stock. Hydravalve are official distributors for major brands in the manual valves and actuation industry, including CMO Valves, Crane, Genebre, Haitima, J+J, Prisma, RuB Valves and YTC. We can also offer various other brands of valves and actuators such as Auma, AVK and Rotork. Resulting in the largest ever stock holding of �2.2 million with over 80% of products being available to dispatch for Next Day delivery. Come and visit us at Valve World D�sseldorf at Hall 5, Stand B32 where our friendly technical team will be able to assist you with any requests. We will also be offering complimentary refreshments and food for our guests.